Hotel Mogador i Paris, Frankrike : Boka nu! The property is full of character. Hotel Mogador features air-conditioned rooms with free wi-fi throughout the property. A delicious French Continental Breakfast is served daily. On a beautiful sunny day, you will be able to your breakfast on the roof terrace. The hotel features as well luggage storage and 24-hour front desk. 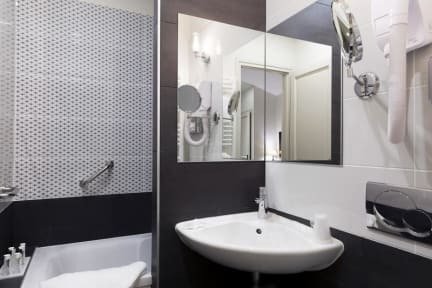 Hotel Mogador is ideally located in the heart of Paris, in the 9th arrondissement of Paris near the Opera Garnier. 9th arrondissement is a great choice for those interested in shopping and art. Tuileries Garden is 1.4 km from Hotel Mogador, and Sacré-Coeur is 1.4 km away. Moreover, the area is particularly well served by public transport. 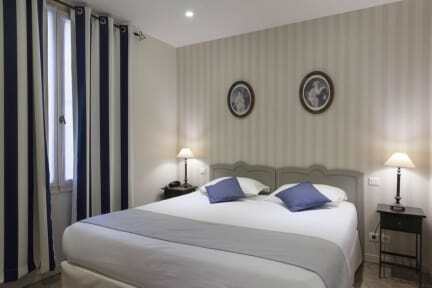 Hotel Mogador offers comfortable and stylish private rooms with bathroom. 17 charming rooms. The hotel offers 17 rooms that can accommodate up to 4 people. Perfect for a couple presents in Paris for a romantic getaway or family trip. Payment types accepted at this property: cash, credit card and debit card (American Express accepted). Taxes not included - Local occupancy tax 0.99 euros per person per night. Baby cot available upon request : 10 euros per person per night. Extra-bed available upon request and management approval - 16 euros extra per bed per night.